It might be a cathedral of marble pillars and vaulted ceilings, stained glass windows and glinting gold. Or perhaps an art gallery adorned with murals and mosaics, statues and busts. But no. This is a library. The largest library in the world. The Library of Congress. The Entrance Hall and the Great Hall teem with people, agog at their beauty. 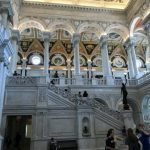 Since I am in the Thomas Jefferson Building – the oldest of the three buildings that constitute the Library – it seems appropriate to climb the marble staircase to ‘The Thomas Jefferson Library’ display. 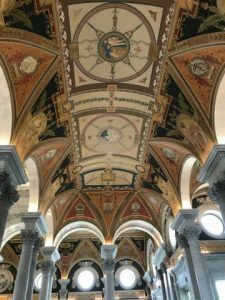 The first Library of Congress was, as its name suggests, a library for Congress sited inside the new Capitol in Washington. But it was destroyed in 1814 when the British set fire to the Capitol. 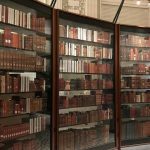 Thomas Jefferson offered his own scholarly collection as a replacement, but in 1851 a second fire had a disastrous effect. 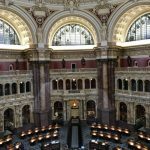 Subsequently a separate and purpose-built Library of Congress, later known as the Thomas Jefferson Building, was opened in 1897. Anyone can visit. Only a few of Jefferson’s books survived the second fire. Today they are signified by bottle green ribbons sprouting from their pages, sitting among sourced copies of many of the original collection. I make my way to the Young Readers Center, stopping first to look at the dimly lit Gutenberg Bible, then am sidetracked along a corridor into a room given over to George and Ira Gershwin. 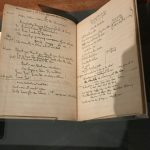 Besides George’s grand piano and Ira’s lyric notebooks, their music is piped into the room as I look around. It’s a recording of Gershwin himself playing the piano, I suspect. 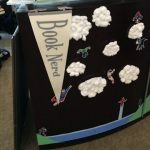 Further on a life-sized Star Wars cutout stands at the entrance to the Young Readers Center where children and parents work together on various activities, while a pennant ‘Book Nerd’ hangs unashamedly from a desk. A poster on the wall proudly declares Daniel Pennac’s ten liberating Rights of the Reader. On to the Main Reading Room where I’m taken by surprise at its striking similarity to the domed reading room of the State Library, Victoria. 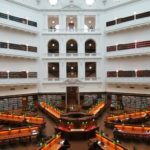 The early Australian architects were inspired by the Library of Congress. On my way out through the Entrance Hall a robot enters and brings everyone to a standstill. A blast of music heralds the arrival of several characters from Star Wars to a flurry of excitement, only to disappear along a corridor. I don’t have time to follow them. But I’m left with the distinct impression the Library of Congress, while still there for Congress, knows how to attract all sorts of visitors with all sorts of interests. It’s on my ‘go back to’ list. Yet another lovely and interesting post, Diana. Fabulous. This is a fascinating story. I so enjoy reading the posts on this site. Thanks, Diana. It really is an impressive temple for books. Your enthusiasm contributed to our determination to see it, Pauline.